Bluefish are almost everywhere in the state, along the beaches , open ocean, bays and tidal rivers. Many party boats fish for them exclusively and will run trips during the day and night. They can run as small as 1-2 lb (Cocktails) or close to 20 lb. They are the most prolific fish in the area and for that reason are the most popular species to fish for. If you want to catch lots of fish Blues provide the best opportunity. It is not uncommon for you to catch 20+ fish per person. Blues are noted for their great fight and fierce appetites. When a blitz occurs they will hit almost anything. Make sure to use a heavy mono or wire leader. These fish have sharp teeth that will make short order of 10 - 15 lb mono or your hand. Watch yourself when getting the hook out of the fish. It's best to use pliers or some type of hook remover. Blues usually arrive in late spring and will stay around well into October. Most of the larger fish are caught in the fall. Diving birds are a sure sign there are Bluefish in the area. Cast a diamond jig or plug into a pack of working birds and your almost sure to get a Bluefish. Chumming from an anchored boat is the most popular way to fish for Blues. Pay out Bunker chum to attract fish while dropping back pieces of cut bunker on your hook. Trolling tubes, jigs, Bunker spoons, plugs or umbrella rigs work great. This method is highly effective for locating fish. Some sharpies will troll to locate the fish and then anchor or drift in the area with bait. In order to keep your trolling lures down at the right depth it is usually necessary to troll with heavy drail sinkers or wire line. Wire line trolling is the most effective. Some sharpies also use down riggers. Jigging for blues works well when there is a large body of fish concentrated in an area. Diamond jigs tipped with surgical tubes are dropped to the bottom and reeled up quickly. They can sometimes be bounced off the bottom as well. Best thing to do is try and find out at what depth they are picking up the jigs and concentrate your jigging there. Many times larger fish will be underneath the smaller ones or at the edge of the school. When approaching a school of breaking fish in a boat slow down and let you boat drift into the school with the engine off. Running over the fish under power will send the fish down and break up the schools of bait they are foraging on. NJ Party boat fishing for bluefish are very popular all along the coast. From north to south the most popular areas are Atlantic Highlands, Shark River/Belmar, Brielle & Point Pleasent, Barnegat Light and Cape May. Use fresh rather then frozen Bunker if you can get it. When chumming be sure not to be too generous or skimpy with the chum. It's a good idea to release chum at 2 to 3 minute intervals to keep a consistent chum slick and hold fish. Too much chum and the fish will hang back for the easy meal and not bother to move up into the slick for your baits. Too little chum and your not going to hold or attract fish. Trolling speed is not too critical for bluefish. Between 2.5 and 4 knots is good although they will also hit at Tuna Trolling speeds of up to 6 knots. When trolling bunker spoons slow it down until you see your pole pulsing in an erratic side to side and bobbing motion. When trolling other lures like tubes,jigs, and umbrella rigs try and stay close to the bottom without hanging up. Pay line out until you feel contact with the bottom and then reel in just enough line to keep your lure from hanging bottom. If you have a fish finder and can determine a consistent depth where your marking fish try and keep the lures at that depth. A usual rule of thumb for wire line is 10 feet of line usually equates to 1 foot of depth. As an example you would let out 90 feet of wire line if you want your lures to run at 9 feet. Every once and a while take the boat out of gear and let the lures free fall then engage the engine again. This change in motion is often times enough to entice a fish to strike. Always try and keep the boat in gear when fighting a fish. This allows you to keep constant pressure on the fish and results in less thrown hooks . When party boat fishing try to stay on the side where the chum is drifting. The trick is to use just enough weight to keep your hooked bait floating along with the chum/chunks. Manually pay out line until you feel a hit. If you run out of line or hit bottom. Then reel up and do it again. Be careful to pay attention to how much line is payed out when you catch a fish so you can let the same amount of line out the next time. These fish will usually suspend at a certain depth and stay there. When fishing from shore with bait it's best to use a float rig. It keeps the bait off the bottom and away from crabs. You can purchase one from almost any tackle store. Weakfish or Seatrout are one of the best tasting and most colorful fish in our waters. They typically like to congregate in bays and rivers rather then the open ocean. They can usually be found along or in deep channels and are often stacked up in great numbers in concentrated areas. Since they are usually in tight schools you will need to locate them. Once you have located a school it's not uncommon to catch 20 + per person. They will typically average a few pounds and get as large as 8-10 lbs. Weakies will usually arrive in the area around June or July and will stay until mid September. They are usually one of the first fish to leave the area when the water starts to cool. Drifting Sandworms from a drifting boat is perhaps the most popular and effective ways to catch Weaks. A three way swivel with a sinker and a 3 to 4 ft leader works well. Chumming from an anchored boat with Grass Shrimp is also popular. Jigging with lead headed jigs works as well. Tip your jig off with a Sandworm, Grass Shrimp or Fins. Delaware bay is perhaps the most popular area of the country to fish for Weakfish. It has a good number of Party boats that fish form them exclusively. Raritan and Sandy Hook bays are enjoying a good come back of these species in recent years. Areas like the Raritan Reach Channel, Princess Bay and the edges of Flynns Knoll are popular. Barnegat bay is also a poplar area but only in specific areas. In addition to a sandworm, put a fire tail rubber worm on your hook. Try to avoid heavy traffic areas since these fish spook easy. Once you have located the fish keep drifts in a concentrated area. These fish are usually in tight packs rather then spread out over a large area. The best way to locate fish is to look for a concentration of birds. If you have a fish finder you will usually mark what looks like clouds of bait fish. When chumming with Grass Shrimp be sure not to be too generous or skimpy with the shrimp. It's a good idea release 5-10 shrimp at 2 to 3 minute intervals to keep a consistent slick and hold fish. Too much shrimp in the water and the fish will hang back for the easy meal and not bother to move up into the slick for your baits. Too little and your not going to hold or attract fish. A slight change in wind direction or tide can turn these fish on or off. When fishing from shore with bait it's best to use a float rig. It keeps the bait off the bottom and away from crabs. Blackfish are usually caught in the early spring and late fall. Fishing with Green crabs and Filddler crabs from an anchored boat works well. Any rock pile in the bay or ocean will hold fish at one time or another. Locating and catching these fish requires a good bit of knowledge and skill. It's not for amateurs. Fishing the ocean is some what tricky since the fishing is done by locating wrecks and rock piles. It's best to fish from a charter or party boat that knows the wrecks and how to fish them. Blackfish are notorious bait stealers. You have to be fast. Some sharpies say you have to set the hook before the fish bite. It's a great way to cure your fishing itch over the long winter. The Easter holiday usually kicks off the season and that's when the party boats start fishing for them. Blackfish usually like cold water so late fall/early winter and the beginning of spring are the best times. Green Crabs or Fiddler Crabs are the best baits fished from a anchored boat. A 3 way swivel with a sinker and a 6 to 8 inch leader works well. You have to be right on the wreck or in the rocks or you won't catch. Best fished from a boat or from a rocky shore line. Any natural or artificial reef is a good spot. Any rock pile in the ocean or bay is likely to hold fish at one time of the year or another. Make sure to bring plenty of rigs. You'll need them since you'll be fishing in areas full of snags. Use a pole with a strong tip so you can get a good fast hook set. Some people like to tie the sinker on with lighter weight mono then the line your fishing with. If the sinker gets snagged it can break free and allow you to save the rest of the rig. Stripers are on a come back in NJ thanks to the conservation measures taking place in the 80's . Several fish in excess of 50 lbs (Cows) are weighed in every year. They are perhaps the most sought after fish in the state due to their size, close proximity to shore and their long strong drag wrenching strikes. They can be caught along the beaches, bays and tidal rivers and rarely stray more then a few miles from shore. There are a number of party and charter boats that fish for them exclusively and will run trips during the day and night. Bass usually arrive in mid to late April and will sometimes hang around until Christmas. The small "schoolies" are usually more plentiful in the spring and the larger "cows" are usually caught in the fall. Drifting live eels or sandworms usually accounts for the most fish. Sandworms in the spring and eels in the fall is a good rule of thumb. Both baits can be worked by tying a rig using a 3 way swivel. Tie the 3 way to the line coming off your pole. On the remaining 2 swivel loops tie a 12-18 inch dropper for your sinker, and a 5-6 foot leader for your hook. A 25 lb. leader is a good happy medium since Stripers don't have teeth and you want to keep line visibility down to a practical minimum. Use the lightest sinker that will allow you to hold bottom. Let your sinker hit the bottom and continue to bounce as you drift. Keep your conventional reel in free spool with the clicker on. When a fish hits the clicker will sound. Let the fish run for a few seconds, engage the reel and set the hook with a sharp strong motion. If your using circle the hook is accomplished by putting tention on the line rather then a sweeping motion of the rod. When fishing with an eels it's a good idea to let the Bass run a little longer to make sure the eels entire length is taken. Chunking from an anchored boat is also a popular way to fish for Bass. Pay out Bunker chunks to attract fish while dropping back pieces of cut bunker on your hook. Trolling tubes, jigs , bunker spoons, plugs or umbrella rigs work great too. This method is highly effective for locating fish. Some sharpies will troll to locate the fish and then anchor or drift in the area with bait. In order to keep your trolling lures down at the right depth it is usually necessary to troll with heavy drail sinkers or wire line. Wire line trolling is most effective. Some sharpies also use down riggers. Make sure you use at least a 6 ft mono leader when trolling for Bass since they tend to be line shy. Stripers like a very slow troll. Anywhere between 2.3 - 2.8 knots is usually about right. If you can't slow your boat down enough either drag a sea anchor or a 5 gallon bucket. Chumming with Frozen Clam Chum has become very popular recently, especially in the spring. Take a bucket of frozen Clam Chum and place it in a wide mesh fish net or chum bag. Tie a rope to it and toss it over the side to create a Chum Slick. Shuck a fresh clam, put the belly on the hook with enough weight to hold bottom and try and cast your bait so it's positioned in direction the Chum slick is flowing. Place your rod and conventional reel in the rod holder with the clicker on and in free spool. When the Striper hits you will hear the clicker go off. Enguage your reel, set the hook and get ready for a great fight. NJ Party boats and NJ Charter boats will fish for Striped Bass. Some fish exclusively in the evening. From north to south the most popular party and charter boat areas for Stripers are Leonardo, Atlantic Highlands, Shark River & Belmar, Brielle & Point Pleasant, Barnegat Light and Cape May. Sandy Hook Area: Sandy Hook Rip and channel, Flynns Knoll, Roamer Shoal, Schrewsbury Rocks. Point Pleasant - Manasquan Inlet jetty and rock jetties along the shore. Barnegat Light: Along rock jetties on LBI and Island Beach State Park. Barnegat Inlet jetties. Cape May: Cape May rips. When chunking be sure not to be too generous or skimpy with the chunks. It's a good idea to release 4 or 5 chunks at 2 to 3 minute intervals to keep a consistent slick to attract and hold fish. Too many chunks and the fish will hang back for the easy meal and not bother to move up into the slick for your baits. Too little chum and your not going to hold or attract fish. Use fresh rather then frozen bunker if you can get it. One Bunker is cut into about 4 to 5 chunks. Don't waste the head it's good bait since its bony and will stay on the hook longer. When trolling speed is critical for Bass. Between 2.0 and 2.5 knots is good. When trolling bunker spoons slow it down until you see your pole pulsing in an erratic side to side and bobbing motion. When trolling other lures like tubes, jigs and umbrella rigs try and stay close to the bottom with out hanging up. Pay line out until you feel contact with the bottom and then reel in just enough to keep your lure from hanging bottom. If you have a fish finder and can determine a consistent depth where the fish are holding try and keep the lures at that depth. A usual rule of thumb for wire re line is 10 feet of line usually equates to 1 foot of depth. As an example, you would let out 90 feet of wire line if you wanted your lures to run at 9 feet. Every once and a while take the boat out of gear and let the lures free fall then engage the engine again. This change in motion is often time enough to entice a fish to strike. Make sure to use at least a six foot mono leader since these fish seem to be shy of wire. 40 Lb line is recommended for your trolling leader. Always try and keep the boat in gear a when fighting a fish. This allows you to keep constant pressure on the fish and results in less thrown hooks . When party boat fishing you usually drift so try and stay in the bow or stern so you can stay on the side where the lines are drifting. When fishing from shore with bait it's best to use a float rig. It keeps the bait off the bottom and away from crabs. You can purchase one from almost any tackle store. Cut Bunker, Clams after a storm and live Eels at night are the best. If your surf casting with lures you need only cast beyond the breaking waves. Bass love the suds because of the structure and water motion. If you plan to fish on jetties use jetty spikes since jetties are usually very slippery. Always look for rips and tears in the water. Bass are attracted to structure and water motion. Fluke are some of the best eating fish in NJ waters. They can weigh up to 10 lbs but 2 lbs is about the norm. They can be caught along the beaches, bays and tidal rivers and are usually fished fairly close to the shore. There are many party boats that fish for them exclusively . Fishing is best during the daylight hours. 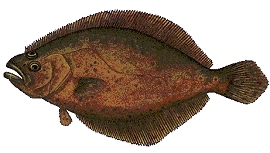 Fluke usually arrive in June and are running strong through August. Best month is June. Drifting a combo of a squid strip and a live killie is the preferred bait. Using a 3 way swivel, tie the 3 way to the line coming off your pole. On the remaining 2 swivel loops clip a sinker directly to one loop and a 4 to 5 foot leader with a hook to the other. Use the lightest sinker that will allow you to hold bottom. Let your sinker hit the bottom and continue to bounce as you drift. Make sure your sinker is on the bottom or you won't catch fish. Set the hook immediately when you feel a bite or resistance. Bouncing a lead head jig with abucktail off the bottom dressed with a strip of squid is also a good method especially when you have a slow or non existent drift. Sandy Hook Area: Sandy Hook and Raritan bay, Flynns Knoll, Roamer Shoal, Keansburg, Keyport and Princess Bay. Belmar: Close to shore off Spring Lake Hotel, Elberon and Deal. Point Pleasant; Barnegat bay and close to local beaches. Barnegat Light: Barnegat bay and close to local beaches. Great Bay & Cape May: Delaware bay and close to local beaches. When party boat fishing you usually drift so try and stay in the bow or stern so you can easily shift to the side where the lines are drifting. Use an English style hook and often times fish will hook themselves. Keep your rig on the bottom or you won't catch fish. Try to fish while tide is moving. You'll cover more area and your bait will look more natural since it's moving.